After a 3-week blogging break it feels awesome to be back for more door fun. 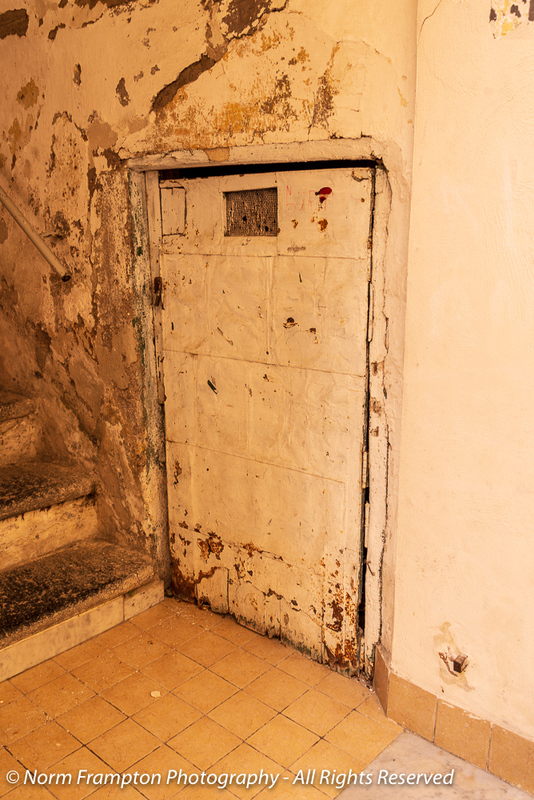 In my upcoming posts you can expect to see tons of doors found during our time in Italy. Just a brief warning: We covered a fair amount of territory and I took well over 1800 pics on this trip, many of them doors, so you’ll be seeing Italian doors from me for a while. But before I start I want to take a minute to thank the three guest hosts who kept our ship on course during my absence. 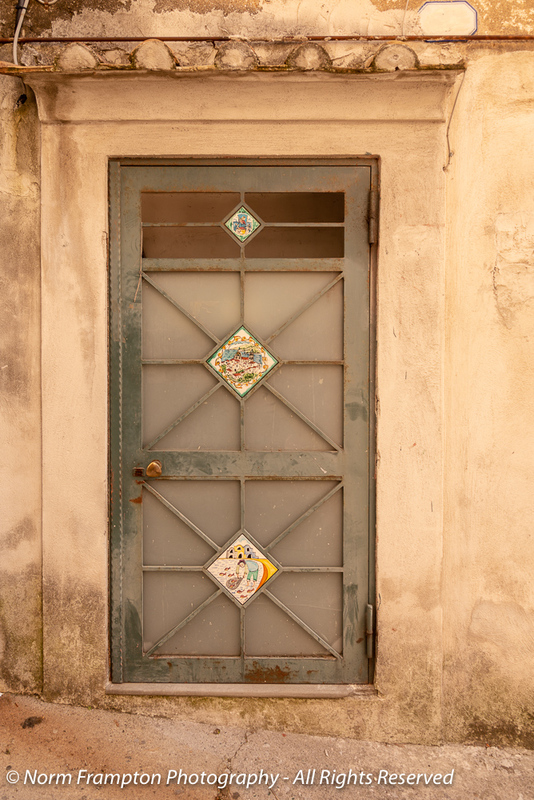 For Week 1, in anticipation of our meet-up the following week Manja from Mexi Movie The Third showed us some of my own favourite Italian doors from her past posts in this collection More Norm’s Doors. In week 2 Joey over at Joeyfully Stated reminded us that weird is wonderful with this post: Moody Blue. For week 3 Dan from No Facilities shared some of the beauty found within Heinz Chapel. Folks, the stained glass alone will have you swooning. My sincere thanks to all three for doing a great job of guest hosting! 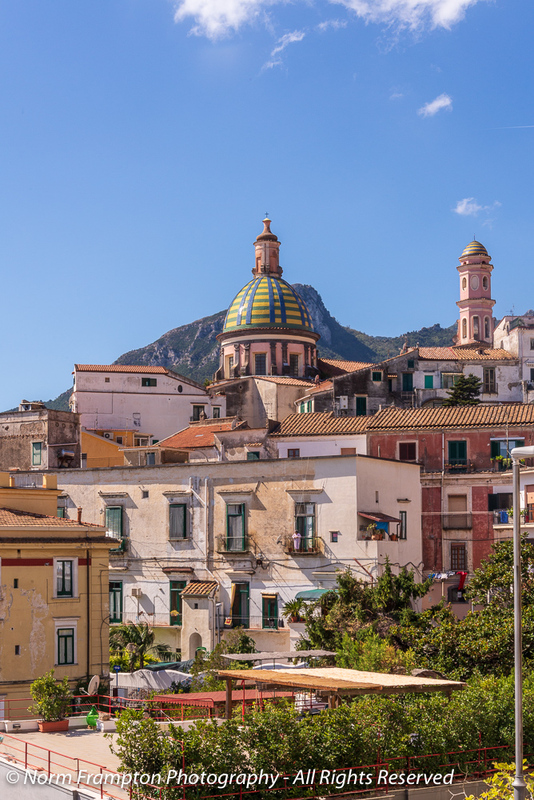 Hugging the rugged cliffs right next to the Port of Salerno on the eastern end of the Amalfi Coast is the lovely town of Vietri sul Mare. Ceramics has been a tradition in this part of the world since the 15th century. An afternoon stroll wandering the narrow streets of the old town netted us some amazing examples of both ceramics and wonderful doors. Door to some sort of electrical box? I don’t even want to know what’s behind this one. 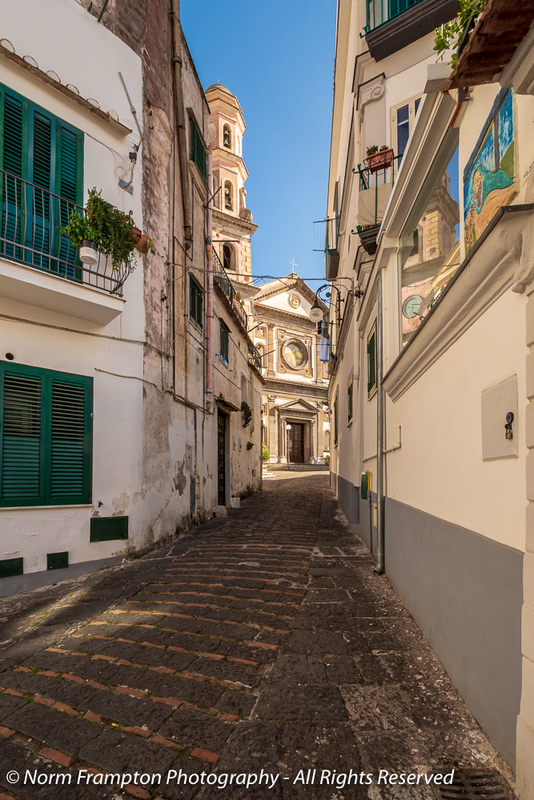 Gallery | This entry was posted in Photography, Thursday Doors and tagged Amalfi Coast, Campania, Italy, Salerno, Tourism, Travel, Vietri Sul Mare. Bookmark the permalink. Glad you are back. Love the ceramic art. Love the doors too. Stunning! Every single one. And welcome back! 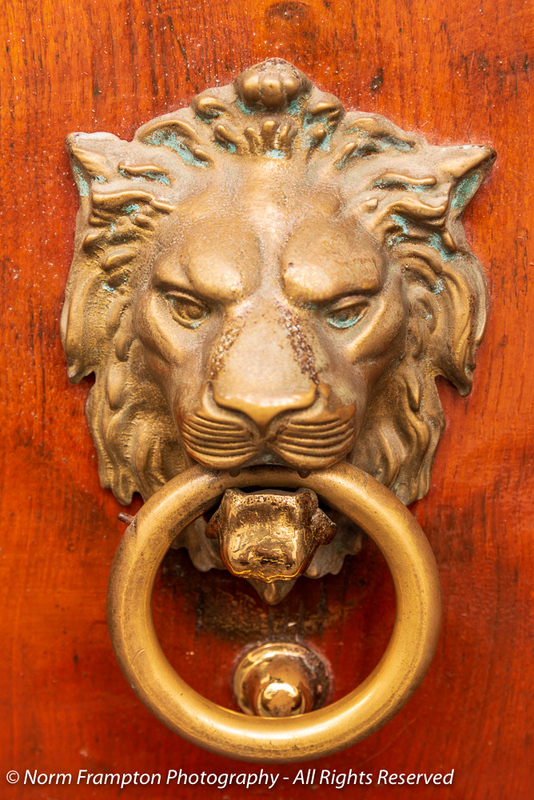 On our one trip to Europe decades ago, our single purchase for ourselves was the same lion’s head door knocker. Your door collection this week is terrific. The warmth is amazing and most of it is just ridiculous in beauty. #19 with the spindles in the panels, though. Ooh, me likey! That’s a new one. It was like this everywhere we visited on the coast. The colors, the architecture, the atmosphere; all so bright and beautiful. I look at the pictures now and have to pinch myself to realize we were actually there. Oh it must have been amazing, and it must have to be surreal knowing you were just there! Oh my, oh my, even I who am here can only sigh. Not only doors, the first two photos are glorious. ❤ And that old train station! And all the ceramics! Thank you for these, who knows where I'll reach below Rome. Viva L'Italia! Welcome back. Norm! 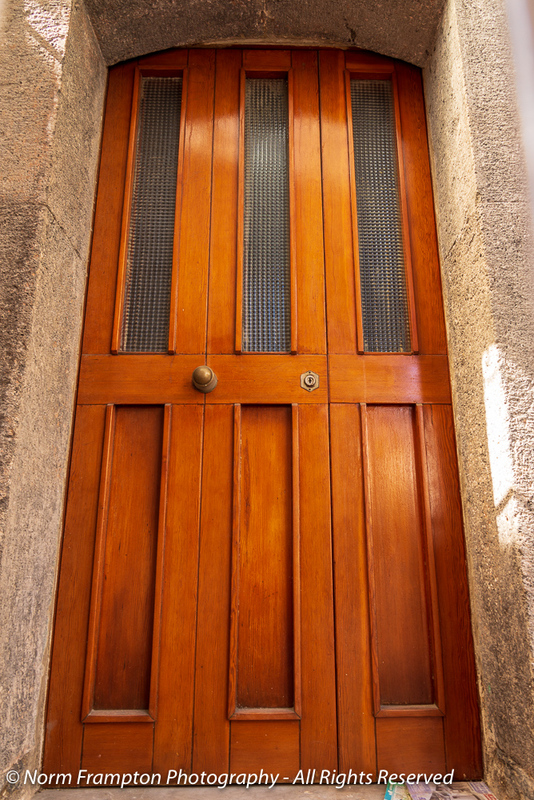 I’m sure you had a fabulous break in Italy and I look forward to seeing great Italian doors in the weeks to come. Thank you Angela. We had a wonderful time. I’m looking forward to sharing some amazing doors over the next few weeks. 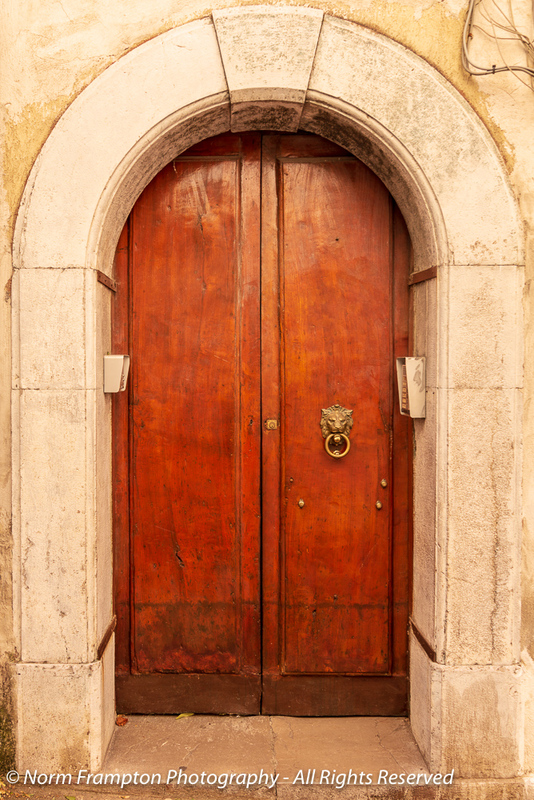 I love Italy and I’m looking forward to all the Italian doors! These are gorgeous! Welcome back, Norm. Can’t wait to see even more of your beautiful Italian doors. For future reference there’s no need to put your link in the comments section here, simply click on the blue frog button and add your link to our list – just as you did. That way all the links are in the same place much easier for everyone to find. If you get the chance check out some of the other contributions too – you’ll find that we have a very friendly bunch of door lovers here. Some great doors there, Norm. I especially like the one with the Lion’s head knocker. 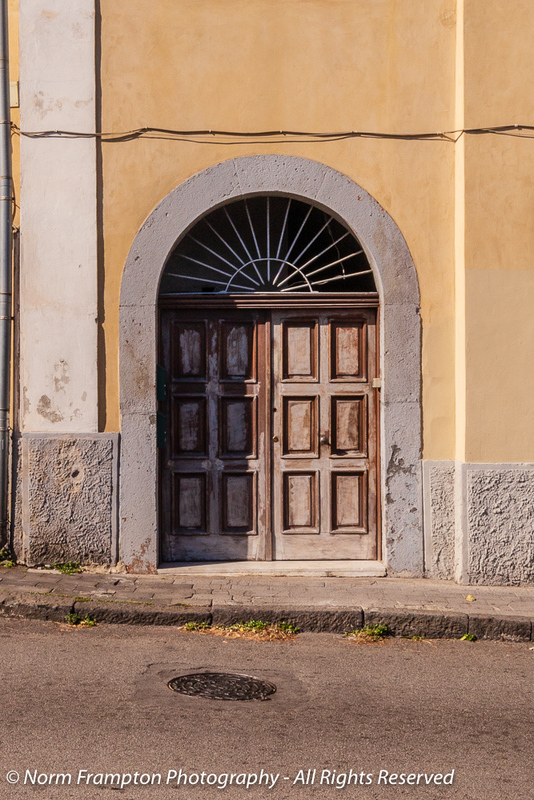 Italy has so many gorgeous old doors. For future reference there’s no need to put your link in the comments section here, simply click on the blue frog button in my post and add your link to our list. That way all the links are in the same place – much easier to find. Beauties! Every one!! 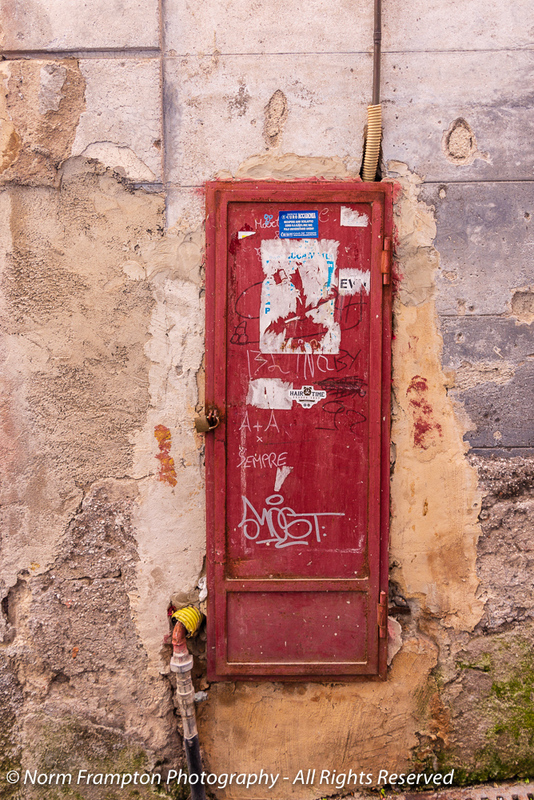 But I love, love the little red door. I’m a little (ok! A lot) jealous of this trip – but in the nicest possible way. So glad you are sharing with us. Thanks Janet. We had such a wonderful time. Welcome back, Norm. Like you, I was traveling for the past few weeks but in very different geographic regions; back home to Hawaii and then to Shanghai to visit my mom and mother-in-law and staying ahead of hurricanes and typhoons on each leg of my trip. 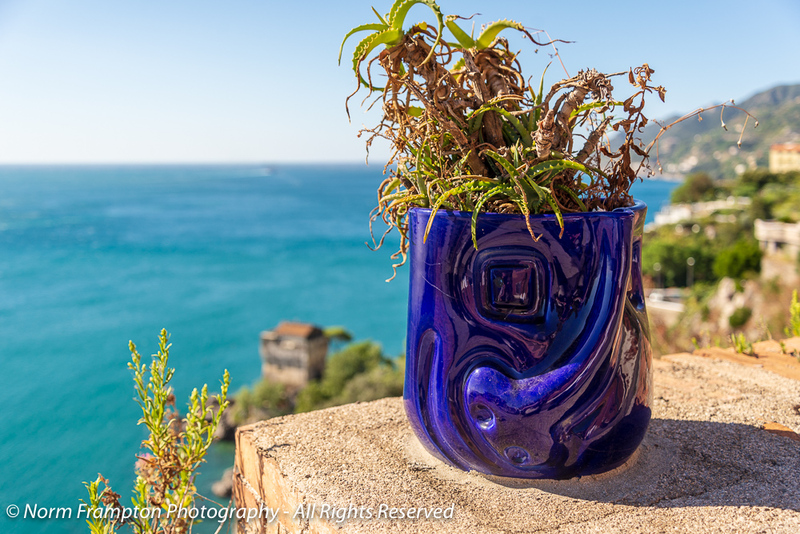 I remember the Amalfi Coast well as we travelled there a few years ago and your post brings back memories and yearnings to return. 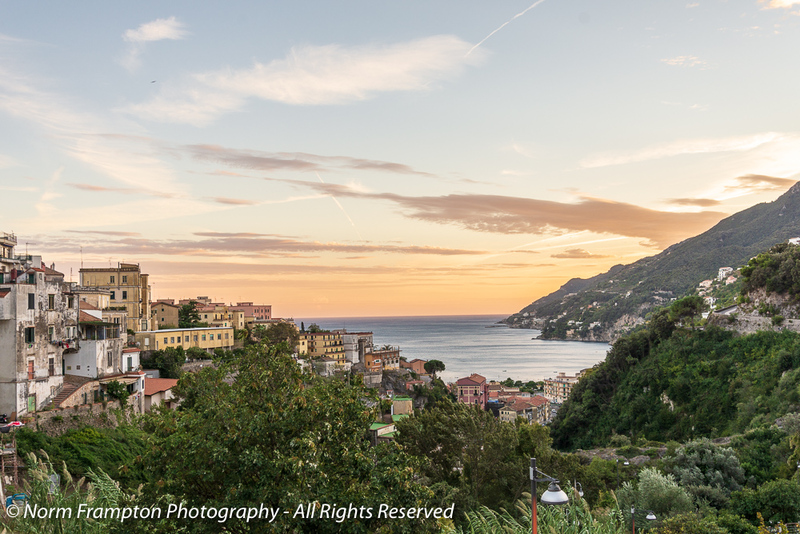 We didn’t get to your town but we stayed in Praiano and lived among the locals and met some very nice residents of that town and traveled to nearby towns by bus or walked the curvy roads shared by pedestrians, cars, trucks and buses. 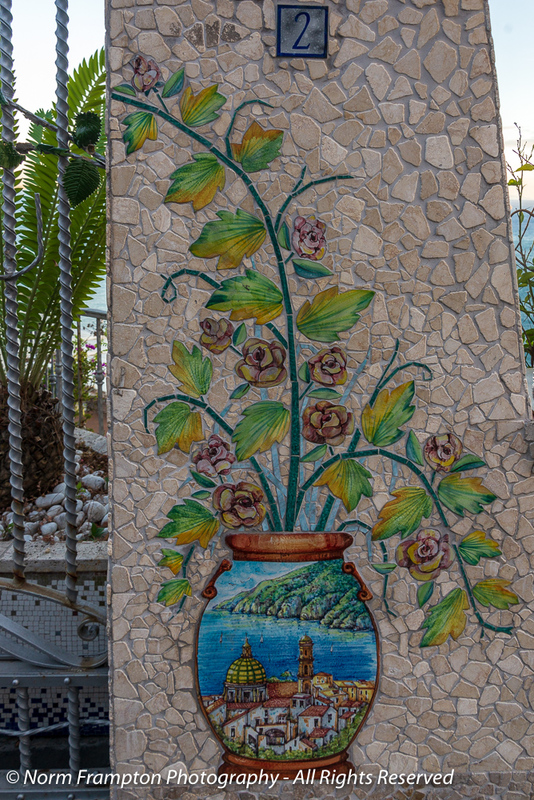 We also saw mini, backyard vineyards, lemon trees, ceramic shops, restaurants and a multitude of doors, like you did but I certainly would like to go back there to do a door shoot like your beautiful door shots. I hope you captured some places that we visited so I’m anxious to see what you have in future posts. Thanks Gordon. We didn’t stop in Praiano but we saw it from the water. The whole region is just lovely, isn’t it? Swooning for sure! And that blue sea. Lovely! Thank you. Oh, it was so beautiful there. Beautiful and/or interesting batch! And that lion-head knocker is the best! Naturally, I favor that door with the squashed arch. Never saw an arch with that configuration, that I recall. Great to have you back! Happy you’re back Norm! Missed your usual plethora of doors:):) Didn’t know where you were going, but serendipitous-ly while you were away I posted about the Mediterranean coast when we were there! Norm, I know that I must have missed several of your comments on Thurs. Doors last few months, and also of other bloggers, so today I changed back to my old blog theme. I just saw your comment today after the change – Tues Oct.16! Welcome back, Norm! 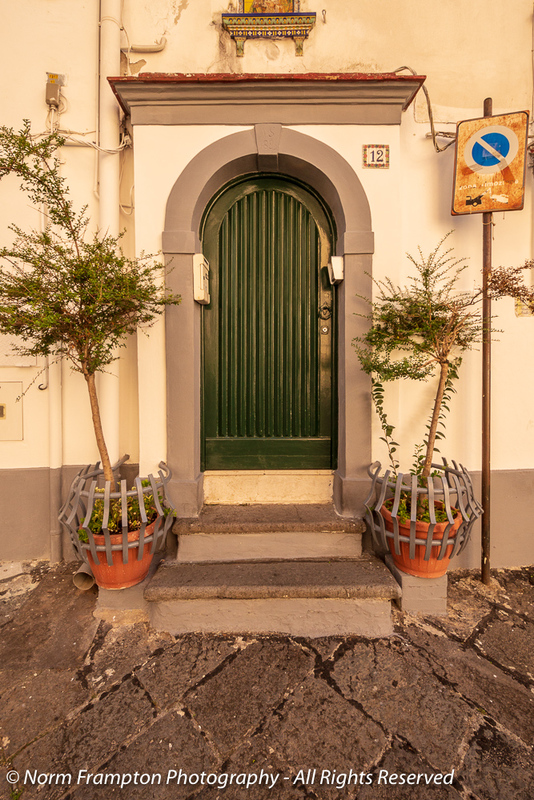 Your first set of doors makes me want to book a trip to Italy today! I look forward to seeing more of these beauties in future posts. Thank you! So many wonderful things to see and experience there, looking at the pics now I have to pinch myself to be sure it really happened. Fantastic to have you back, and your stand-ins did a terrific job while you were away. I don’t know where to begin. First…envy…three weeks in Italy. Second…impressed…1800 pictures, that is a lot. 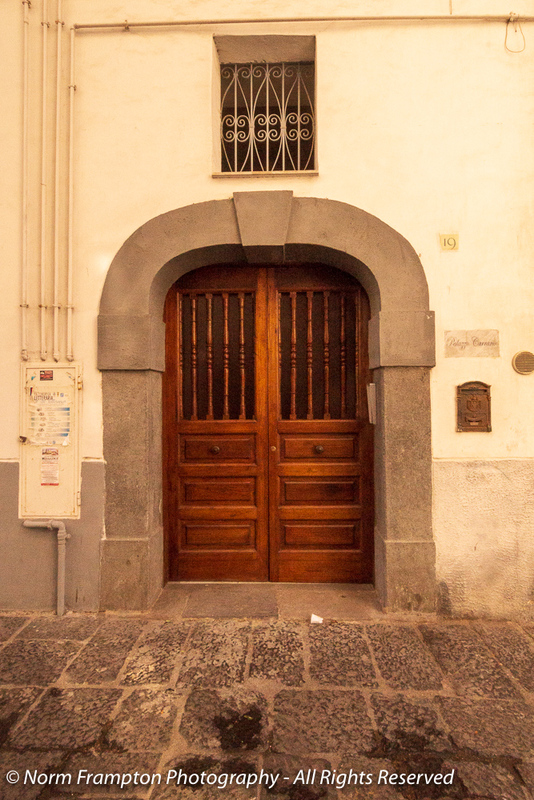 Third…excited…to see all those Italian doors. This week you have started off in excellent form, and including those beautiful ceramics is a generous bonus. Each of your doors is a winner and I’m already looking forward to next week’s report. Amazing pictures. Doors – the entrance into a rooms own individual world. Norm, all that I can say is lovely, lovely, lovely doors. It appears you had a great time in Italy, but I don’t envy you sorting through the 1800 photos. You need another week’s vacation for door photo organization and selection. Wow Norm – any of your pictures would make excellent postcards! You really knocked it out of the park. I just returned from Canada and have a few doors shots to share but I am completely out of gas – no energy and fighting off a cold. Maybe next week – and congrats! A stunning collection. Thanks Jan. If I remember correctly you were in Nova Scotia, yes? Looking forward to hearing all about it. In the meantime I hope you can rest up and feel better soon. 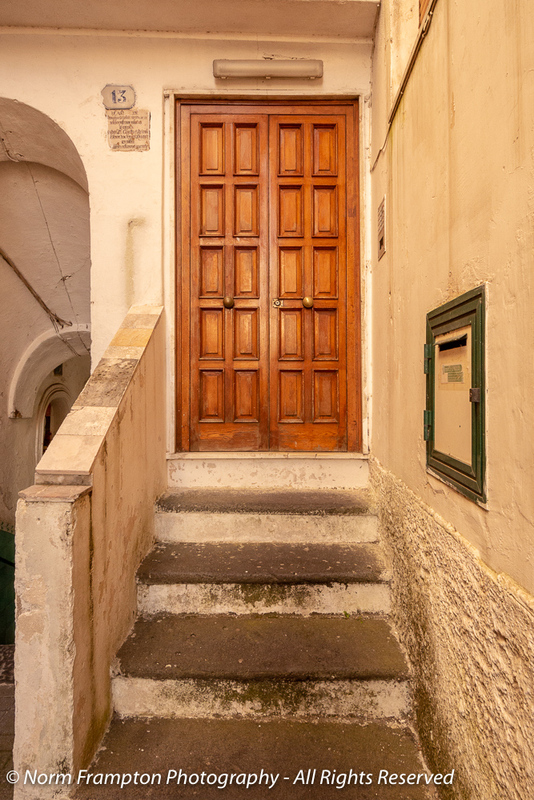 Nothing like Italian doors: what with the sun and the beautiful textures of the walls around them. Nice to have you back, although I enjoyed the work of the temporary hosts. Thank you I.J. Yes the guest hosts did a wonderful job. I’m hoping to circle back and check out everyone’s posts over the weekend. Welcome back. Italy is such a beautiful country to go on a doorscursion, Norm. You captured some great shots, I love the tiles as much as the doors. Keep them coming! Looking forward to seeing them. Wow, Norm. Now, I’m not only fighting off waves of door envy but am also trying to dampen my desires to revisit Italy. My attention was drawn to the dastardly looking mystery door and know nothing good could be behind it. I used to paint ceramics and so that element of your visit to Vietri sul Mare also fascinated me. Looking forward to seeing your adventure unfold in what must be coming months. Thank you Rowena. We had such a wonderful time that as I go through the pictures I have to keep pinching myself to be sure it was all real. Norm, you have outdone yourself. These photos are spectacular. Thank you but this is just the tip of the iceberg. Lots more to come. 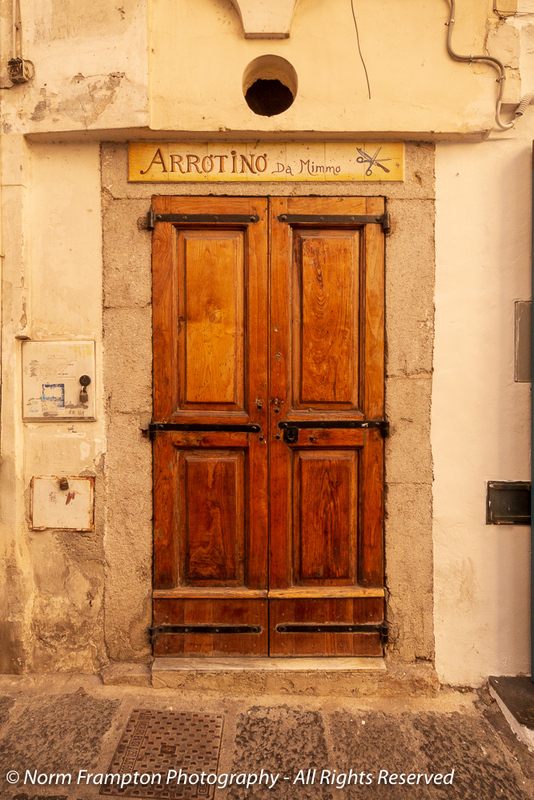 A great collection of Italian doors. Here’s to many more to come! Quite a collection of doors, sounds like you enjoyed your trip. 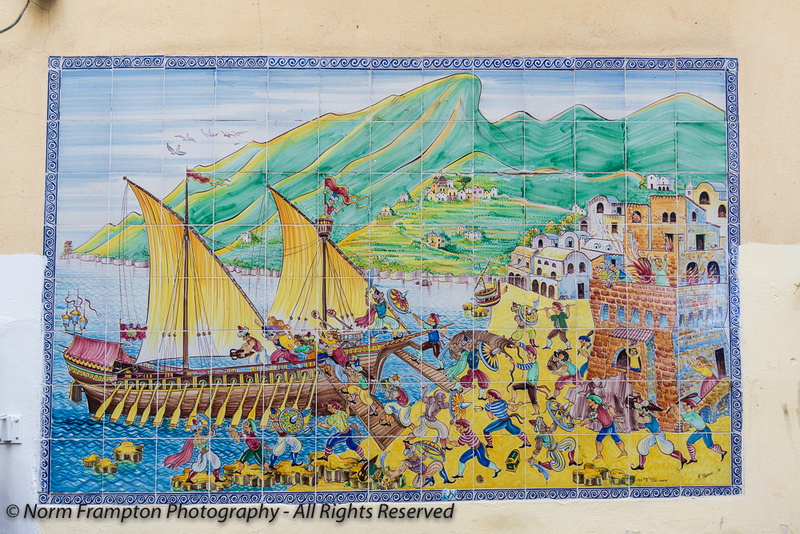 The first ceramic mural with the ship looked a bit like a page from “Where’s Wally?” (I think the name may be different on the other side of the pond). Golden, honey-coloured light on many of the doors makes them look good enough to lick. Thanks Ian. 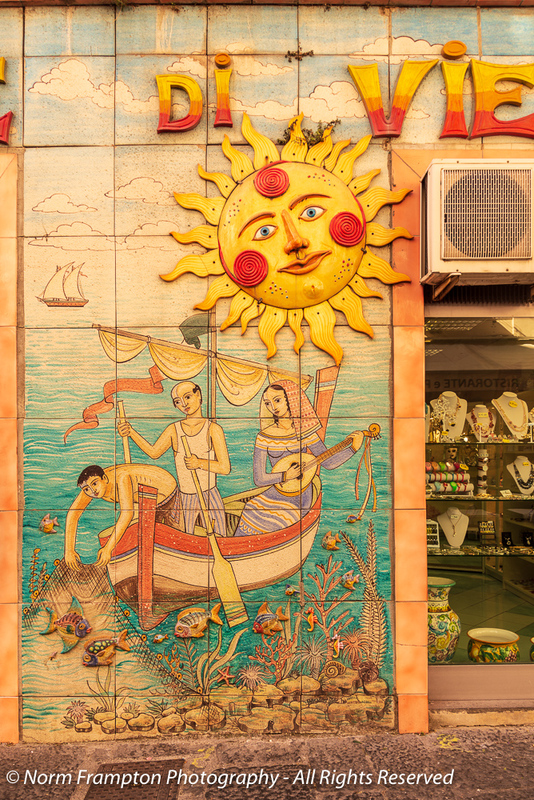 We saw lots of warm sunny ceramic art during our time in this part of the country. If this post is any indication of things to come, I say, “Bring it on!” These are remarkable doors, alleys, scenes, etc. Just lovely. Looking forward to the photos and the narratives. Very cool. I like the ceramic with the big ol’ sun the best (so far). Thanks Tara. I should probably do a post just on all the ceramics we saw. I would like that. We have a lot of ceramic/tile history in Pennsylvania with the Moravians and all. All your photos are amazing love the colours. I love the second photo with the 2 domes against that intense blue sky and although there are so many wonderful sights, my favourite door is the one with the 3 ceramic tiles of increasing size from top to bottom. I’m looking forward to seeing your collection of doors unfold! Welcome back, Norm! Thanks Joanne. As you know, the best part is that as we go through all of these pics we get to relive the trip all over again. Looking forward to your Italian photos! Beautiful scenery and photos, and great doors too! So much beauty! It probably won’t come as a surprise, but I am thrilled that you found an old – stone/brick – train station! I love that door. The ceramics are equally as beautiful (and fun) as the doors. I’m glad you had a great trip, and I look forward to many more such doors. Thanks for the mention. Thanks so much Dan. 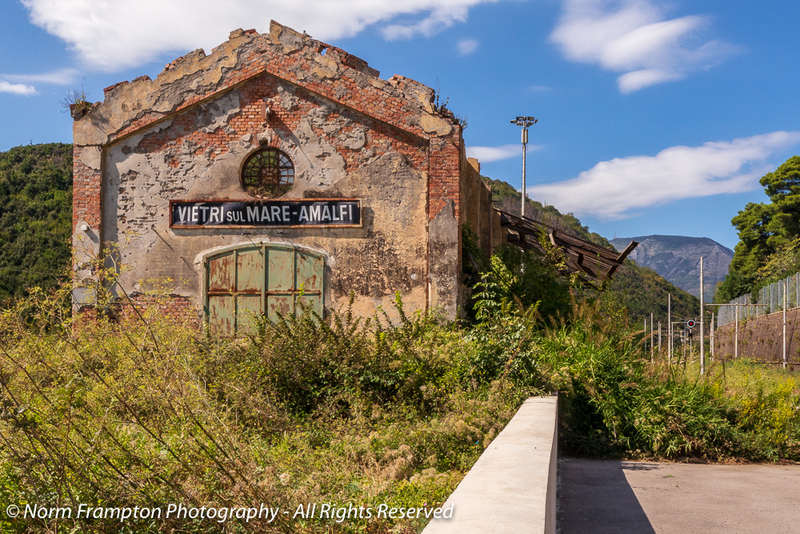 I was thinking of you while on our hi-speed train ride from Rome to Naples. The train got up to 300 k/h at one point but was so smooth we hardly knew we were moving. I don’t understand why we don’t have these here in North America. Wow! That would be less than 2 hours from Hartford to Montreal. I wish we would get serious about rail travel. Doors from Italy – mine are all from the Czech Republic. 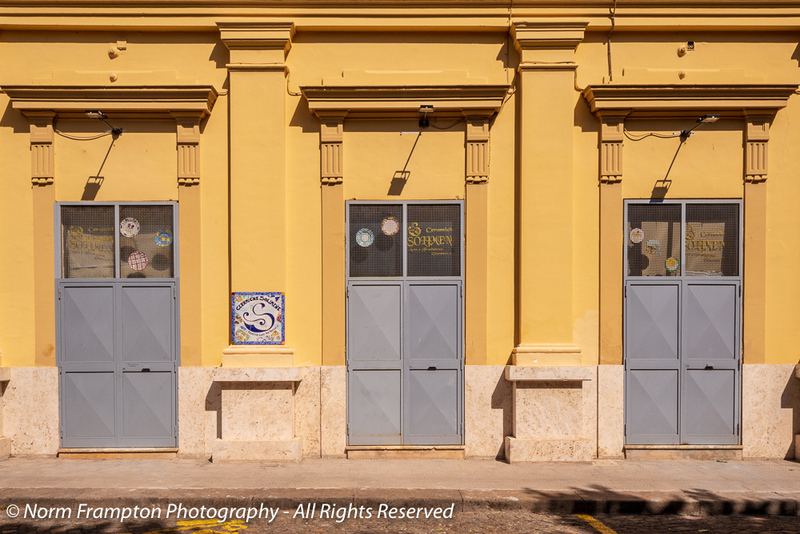 A great Italian wander, wonderful doors and I loved the colours. I’m very much looking forward to your continued Italian posts. Ive got something more northern – from iceland.